With Star Wars: The Force Awakens arriving in theaters this December, I’m examining some of the Star Wars comic books and novels of the past. 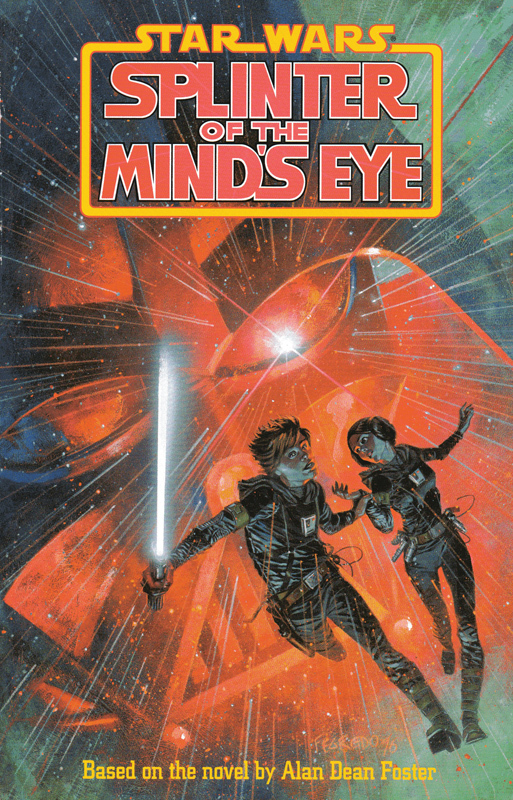 Today’s post looks at the very first entry in what is now referred to as the “expanded universe.” Splinter of the Mind’s Eye was written by Alan Dean Foster and published in February 1978, eight months after the debut of the original movie. Foster’s novel opens shortly after the events of A New Hope. Luke Skywalker and Princess Leia Organa, accompanied by the droids R2-D2 and C-3P0, are traveling to the fourth planet in the Circarpous system. They hope to convince the inhabitants of Circarpous IV to join the Rebel Alliance. Before they can arrive at their destination, Leia’s spacecraft develops a malfunction. They are forced to head towards the fifth planet, Mimban, an inhospitable swamp world. A sudden electrical storm causes both Leia and Luke’s ships to violently crash-land. After days of slogging through treacherous swamp, the two Rebels and their droids come across a human settlement. Unfortunately it is an Imperial installation; the Galactic Empire is secretly mining the planet’s mineral wealth. Stealing mine uniforms, Luke and Leia visit the town saloon. They meet Halla, an elderly woman who possesses a slight affinity for the Force. Halla is seeking the Kaiburr Crystal, a red jewel that “increases one’s perception of the Force.” The crystal is thought to be a myth, but Halla has acquired directions to the ancient native temple where it is supposedly located, as well as an actual shard of the crystal (the eponymous “splinter of the mind’s eye”). Luke touches the shard, and his connection to the Force confirms that it is genuine. Halla makes a deal with Luke and Leia: if they assist her in locating the Crystal, she will help them steal a spaceship to escape Mimban. Before plans can be made, Luke and Leia get into a brawl with a group of drunken miners and are arrested by Stormtroopers. The two are brought before the planet’s Imperial overseer, Captain-Supervisor Grammel. While suspicious of their claim to be criminals fleeing from Circarpous IV, Grammel is intrigued by the crystal shard Luke and Leia possess. He orders them locked up and contacts his superior, Governor Essada, who possesses some knowledge of crystals and minerals, hoping to obtain an assessment of the splinter’s value. Essada unfortunately recognizes Leia from the security photo Grammel sends him, and the Governor orders the two to be held until someone can be dispatched to interrogate them. Luke and Leia are placed in a cell with two large hairy aliens known as Yuzzem. Hin and Kee have been jailed for drunk & disorderly conduct, having caused a major ruckus after they realized they were unable to get out of their indentured servitude to the Empire. Luke convinces the angry, hung-over Yuzzem that he and Leia are also enemies of the Empire. At that point Halla pops up at the window of their cell. She combines her minor Force abilities with Luke’s, and the two of them levitate a food tray between the bars, using it to activate the switch for the cell door. The prisoners make a break for it, with Him and Kee causing tremendous destruction. They rendezvous with Halla and the droids, steal a swamp crawler, and flee the settlement. Heading out in search of the Kaiburr Crystal, the seven fugitives encounter numerous dangers in the swampy wilderness. Luke eventually realizes that they face another fearsome adversary: Darth Vader has arrived on Mimban searching for the Rebels. The Sith Lord also recognizes the significance of the Crystal and seeks it to augment his dark powers. Alan Dean Foster was involved in the Star Wars universe from very early on. When the first movie was still in production he was hired by George Lucas to ghost write a novelization based on an early draft of the script. Foster was also contracted to write an original novel that could serve as a sequel. Lucas was uncertain if Star Wars would be successful, and he instructed Foster to devise a story that could be shot on a small budget, using as much of the existing props and costumes as possible. From this directive Foster devised Splinter of the Mind’s Eye, with its relatively small cast and its setting on a dark swampy planet. Of course, as we all know, Star Wars was a gigantic success, and Lucas was able to make a very ambitious sequel, The Empire Strikes Back. Nevertheless, although Splinter of the Mind’s Eye was never filmed it is still a good read, an interesting link between the two movies. Even working within the constraints given him, Foster writes an entertaining novel with exciting action sequences. There is a cinematic quality to Foster’s writing that definitely brings these scenes to life. The novel culminates in a riveting lightsaber battle between Luke and Vader in the ruined Temple of Pomojema for possession of the Kaiburr Crystal. Written as it was in 1977, there are inevitably a few aspects of the novel that don’t fit the later canon too neatly. There’s no indication that Darth Vader is Luke Skywalker’s father. Some of Foster’s dialogue for Vader seems a bit off, at least considering how the character was subsequently scripted in the next two movies. Foster includes sexual tension between Luke and Leia, as this was well before Lucas revealed (or perhaps even decided) that they were brother and sister. Commenting on this in 1996, Foster stated “the tension in the book between Luke and Princess Leia works even better in hindsight, now that they can be seen as squabbling siblings ignorant of their true relationship.” I suppose you could argue that. At least Foster didn’t show the two of them actually kissing, unlike that now-unfortunate smooch on Hoth a couple years later! On the other hand, Splinter of the Mind’s Eye actually forecasts certain elements of the series. I wonder if Lucas was influenced by it when writing the sequels and prequels. Mimban is very much like the planet Dagobah. During the battle in the Temple, Vader uses something similar to the “Force lightning” later utilized by the Emperor. The first time I read Splinter of the Mind’s Eye in 1989 this was puzzling. How could Vader possibly know how to shut down R2-D2 and C-3P0? Of course, once the prequels came out, this made perfect sense, as we found out that C-3P0 was built by Anakin Skywalker, and R2-D2 was his astromech droid during the Clone Wars. So of course decades later Vader would know how to deactivate both of them. Again, I wonder if Lucas got the idea of tying Anakin / Vader to the two droids from Foster’s novel. One of the weak points of the original Star Wars was that we never saw the events of the movie having any sort of lasting impact on Leia. The way that Lucas filmed the scene setting up Leia’s interrogation by the Empire, it is very strongly implied that they are going to do something horrifying to her. But the next time we see her she is seemingly unharmed and defiant. Likewise, the destruction of Leia’s home planet of Alderaan is almost shrugged off by Leia. Foster addresses this in his novel. Leia has been hardened by her experiences. Luke is aghast at the carnage and bloodshed of their battles with the Empire, but the more cynical Leia grimly accepts it as an unfortunate necessity. While imprisoned by the Empire on Mimban, Leia finds out from Grammel that an Imperial Governor will soon be arriving to question her. Her immediate reaction is uncontrollable panic as she flashes back to her ordeal on the Death Star. Leia soon recovers her composure, but it is apparent that she still carries psychological scars from that experience. 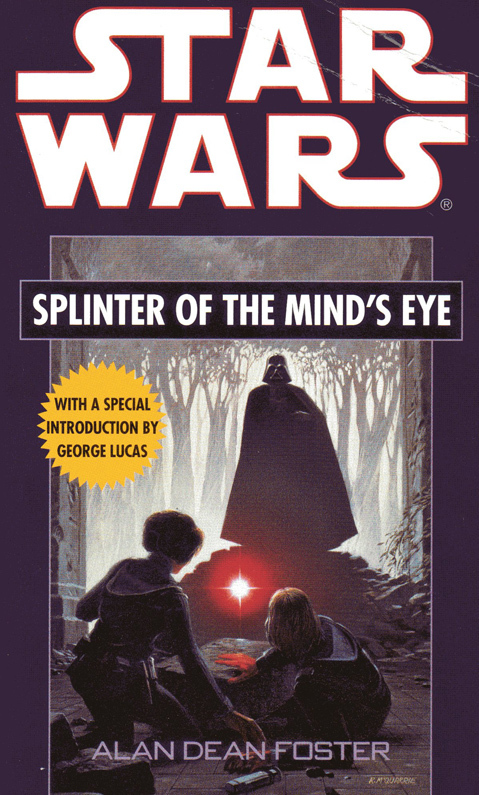 The cover for Splinter of the Mind’s Eye was painted by Ralph McQuarrie, the artist who played a significant role in devising the look of the Star Wars universe, designing many of the characters and sets for the original trilogy. His atmospheric rendering of a stunned Luke and Leia witnessing Vader’s arrival at the Temple of Pomojema is now an iconic image. In 1996 Dark Horse published a four issue comic book adaptation of Splinter of the Mind’s Eye written & inked by Terry Austin and penciled by Chris Sprouse. The miniseries was collected in a trade paperback with a cover by Duncan Fegredo. Alan Dean Foster contributed an introduction. It’s interesting to observe the choices Austin made in adapting a 300 page prose novel into a 97 page graphic novel. A certain amount of condensing of scenes and dialogue was required. Austin did a good job at keeping the important plot and character elements while working within a smaller length. Austin took advantage of the fact that he was working in 1996 to add a few elements from subsequent movies. Darth Vader is given a couple of short scenes that precede his original introduction more than three quarters of the way into the original novel. In these Austin gives glimpses of Captain Piett, the flagship Executor, and an Imperial shuttlecraft arriving on Mimban. Sprouse does wonderful work bringing the elements of the novel to life. His designs for Halla, the Yuzzem, the giant swamp worm Wandrella, the native tribe of the Coway, and the Temple are all very effective. Sprouse has always done good work on sci-fi / pulp-themed series, most notably Legion of Super-Heroes and Tom Strong. That makes him a great fit for the Star Wars universe. Austin is, of course, one of the all-time greatest inkers / embellishers in comic books. As good as Sprouse’s penciling is on the Splinter of the Mind’s Eye, Austin’s inking makes it even more amazing. Their styles mesh very well indeed, and their adaptation of Foster’s novel is wonderful. While Lucas has proclaimed that he “always” knew Vader to be Luke’s father, it’s clear that he didn’t come up with this idea until sometime after commissioning Alan Dean Foster to write this book, and Leigh Brackett to write Episode V.
And yet… when you watch Episode IV, it’s so obvious that Vader *has* to be Luke’s father. We hear over and over (and even more, in the now commercially-available deleted scenes) that Luke’s father was an excellent fighter pilot. And, in the last act of IV, we *see* that Vader is… an excellent fighter pilot, shooting down the entire Rebel fleet one by one, and nearly getting Luke before Han Solo famously flew out of the sun to force him out of the way. Yes, the Star Wars story changed dramatically from when George Lucas first conceived it. It’s quite obvious that even after the first movie was made the backstories of the characters were still in flux. It is possible that Lucas may have considered making Darth Vader the father of Luke Skywalker early on, but he definitely did not commit one hundred percent to it until the process of writing The Empire Strikes Back was well underway. The first draft of the screenplay that Leigh Brackett handed in shortly before she passed away included a scene where Luke speaks to the “Force ghost” of his father Anakin on Dagobah. So it is unlikely that Lucas mentioned to Brackett the possibility that Vader was Luke’s father. Having said that, as you yourself commented, once Lucas did decide to go in that direction, it did suddenly seem obvious when re-watching the first Star Wars that, yes, Vader IS Luke’s father. It just seemed to fit. The story that Obi-Wan initially told Luke about Anakin’s death was probably intended to be taken at face value when originally written, but it does also make sense when Obi-Wan later explains away his lie as a metaphor for what actually happened. Bought this book when I was 9 at a used book store because I was buying every Star Wars at that point. On top of that the original cover always captivated me. Great synopsis and analysis of the book. I think I got more out of your article than I did reading the novel as a kid. Great job as usual sir.